TestOil has developed this 2-day training course to be both practical and cost-effective. Attendees will learn the latest and most critical knowledge of oil analysis. This course provides coverage of a combination of lubrication fundamentals, sampling procedures, contamination control, and storage and handling. Includes a brief tour of the TestOil lab. 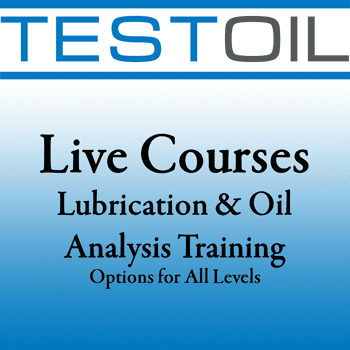 This course builds on the foundation knowledge from Day 1, then adds how they are measured and how to interpret oil analysis data to determine the appropriate course of action. Registration includes all course materials, as well as a light breakfast, snack, and lunch on both days. Group Rate is $99. Use code TES. This is a 3-day course designed to prepare attendees for the Certified Lubrication Specialist™ (CLS) certification exam offered by The Society of Tribologists and Lubrication Engineers (STLE). While this course covers all the topics in the body of knowledge, we make no statement that this training alone will fully prepare an attendee to challenge an exam, nor guarantee successful certification. Registration includes all course materials, as well as a light breakfast, snack, and lunch each day. Evan is heavily involved with STLE, having been a member for over 18 years, serving the last 8 years as Editor of TLT Magazine, recently joining the Board of Directors and previously serving as editor of The Basic Handbook of Lubrication – Third Edition. Those completing the course are eligible to challenge either of the MLT I, MLT II, MLA I or OMA I certification exams offered by ICML and STLE. Although TestOil is providing this course, it is not a prep class for the exams. Through this course, we seek to refresh and clarify the knowledge each student should largely possess, while filling in any gaps, in order to be prepared to write an exam. Exams will be hosted on Friday morning following the course. For more information: 216-251-2510. *Accendo Reliability participates in the TestOil affiliates program. This affiliate advertising program provides a way for sites to earn a referral fee on links to TestOil courses. In short, this means when you register for a course with TestOil after following a link from this site, we get a small percentage of its price. This helps support Accendo Reliability by offsetting a portion of the cost to maintain the site. And, your support is much appreciated.